Published on November 22, 2017 in Daily Dirt, Equipment & Products and National. 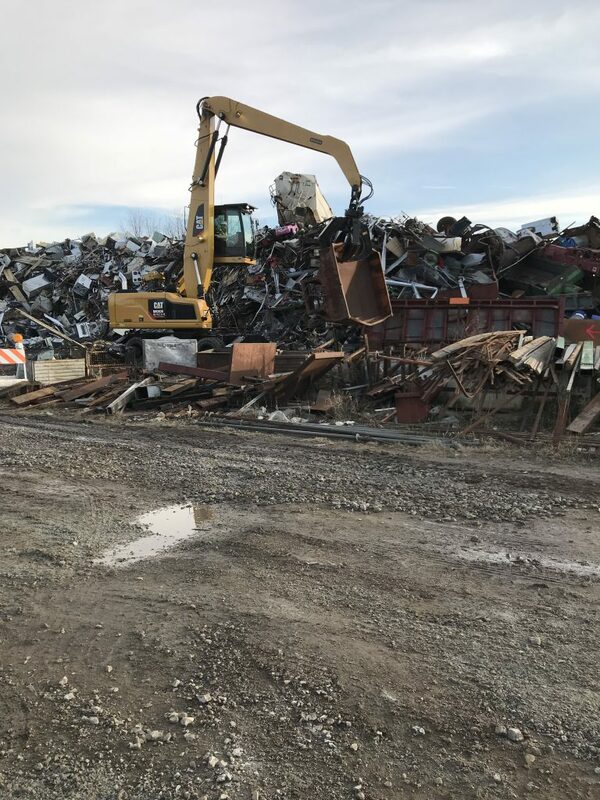 Closed Tags: Cat, Caterpillar, construction, construction industry, contractors, excavators, heavy equipment, scrap, scrap handling, waste, wheel excavators. The new range of Cat® wheel material handlers (MH3022, MH3024, MH3026) maintains the Caterpillar purpose-built philosophy for these machines while reflecting engineering refinements that tailor them more precisely to specific industrial applications. Further improvements for these 2018 models include features that support rapid return-on-investment and enhance overall performance, versatility, and safety. The design of the new material handlers is focused on application efficiency and reduced owning costs. For example, users need not buy a machine with a wide undercarriage if materials being handled are low density, and shorter front linkages are available if the machine frequently works in confined spaces. The MH3022, for instance, is an agile solution for handling jobs with space constraints, providing the necessary reach for tasks such as indoor sorting and waste-handling, yet providing application flexibility with a choice of two MH booms, three straight sticks with linkage, and two drop–nose sticks. The compact undercarriage is wide enough for excellent stability, while the centered position of the swing bearing allows equal capabilities when working over the front and rear. If work requires greater lifting capacities and a larger working envelope, then the MH3026 is the optimum machine, equipped with a long MH boom and providing a choice of three drop-nosesticks—ranging in length from 4.9 to 5.9 m (16.1 to 19.3 ft.), three straight sticks—and a choice of three undercarriage sizes. are now available, having lengths of 4.5 m (14.75 ft.) and 5.5 m (18.1 ft.). 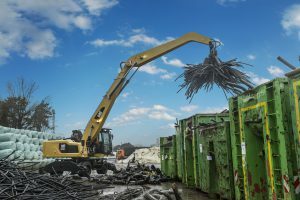 The new sticks can be an efficient solution when moving a machine between job sites is a frequent occurrence, allowing transport without removing the stick. Sticks are designed to keep transport heights below the critical 4-m (13.1-ft.) dimension for significant time/cost savings. Another noticeable addition to the new models is the front push blade, now available for all undercarriage types. These blades provide an easy way to clear the working area and push materials commonly encountered in waste and mill-yard applications. Working on surfaces free of debris can further extend tire life, resulting in greater operational efficiency. Operational efficiency gets a further boost with redesigned, optimized, Cat orange-peel grapples. Designed to be an exact match between tool and machine, the new grapples can contribute to decreased fuel consumption—by as much as 15 percent in some applications. The grapples feature reduced weight for shorter cycle times and increased productivity. Additional cost savings are available through the increased durability of the grapples, which have castings in place of welded structures in high-stress areas. Operator health and safety are primary design goals for the new material handlers. To that end, an Advanced Cab Filtration system, available as an integrated option from the factory, is recommended when machines work in dusty, contaminated environments, especially indoors. The system almost completely eliminates dust and contaminants (insecticides, spores, fungi, bacteria, or vapors—for example) from entering the cab. In addition, the system eliminates the need to add cumbersome after-market filtration systems to the machine. Also, an Easy Cab Access option, which installs steps on the front and rear of the undercarriage, facilitates cab ingress/egress when the upper frame is not aligned with the chassis. Published on November 24, 2012 in Daily Dirt, Equipment & Products and National. 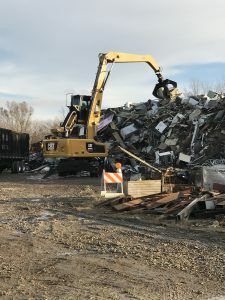 Closed Tags: construction, construction industry, contractors, equipment, excavators, heavy equipment, magnets, scrap, scrap grapple, scrap handling, Terex. Terex® Fuchs work attachments are purpose built to withstand the demands of scrap, recycling and heavy-duty rehandling applications. With size ranges built specifically for each material handler model, these attachments work in unison with the machine to increase productivity and lifting efficiency. From cactus grabs to magnet plates to lift hooks, Terex offers a range of options with quick-attach designs, so operators can switch between attachments within a matter of minutes to reduce downtime and increase productivity. 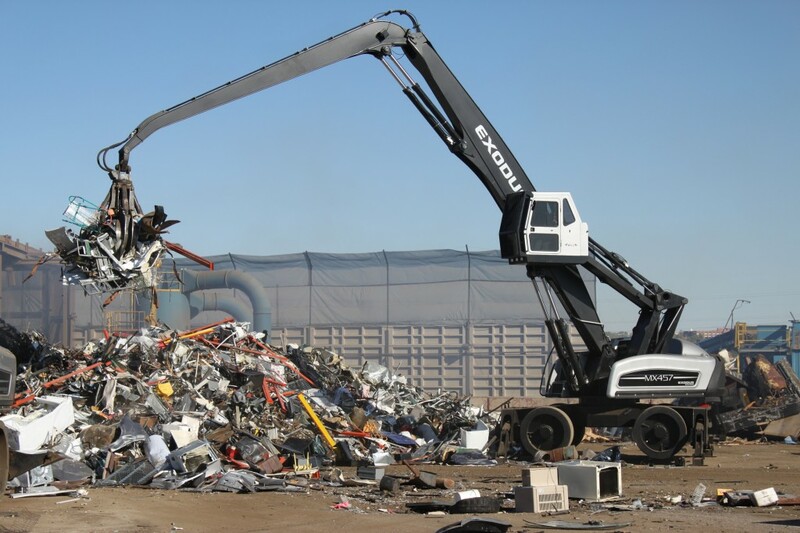 Terex Fuchs Cactus Grabs are solidly built to withstand the rigors of scrap handling and recycling applications. Featuring robust construction and advanced kinematics, these cactus grabs boast high tine-closing forces and hydraulics that are performance-matched to the machine for powerful and precise material handling. Constructed of high-quality materials and proprietary features, Terex Fuchs Cactus Grabs offer long life in demanding applications for a higher return on investment. The durable grab rotator is an integral part of the upper grab section for reliable operation and simple servicing. Cylinder rods and hydraulic lines are well protected against external damage. Wear-resistant, high-manganese steel tine tips extend attachment life, while HARDOX steel reduces abrasion of grab shell areas subject to wear. A variety of cactus grab models with capacities from 0.5 to 1.8 yd3 are available to match material handler production capacity and application requirements. An open tine design is available for handling bulky items, while half- or closed-shell tine models excel at handling finely shredded material. Grabs with capacities ranging from 0.5 to 1.0 yd3 can be equipped with a magnet to improve grapple flexibility. Designed for scrap and re-handling applications, Terex Fuchs Electro Magnets exert a powerful field force over the entire diameter of the magnet plate for high handling capacities. Boasting lift forces from 22,480 to 85,427 ft-lb, each magnetic plate is precisely matched to the standard DC generator found on each Terex Fuchs material handler model. Operators control the magnet’s counter excitement through momentary pole reversal, so even the smallest iron pieces immediately drop off. Terex Fuchs electro magnets are available in hydraulically rotating, rigid and chain suppression plate designs to meet virtually any application. Magnet upper sections are made of a durable special cast alloy, while the magnetic plate features a “dynamo steel” casting with a non-magnetizable cast steel base plate. The plate’s hollow core design reflects heat to regulate operating temperatures. Magnet diameters range from 37 to 79 in, precisely matching each material handler model. The hydraulically rotating gear is wear-resistant and enclosed in a sealed housing for magnet diameters reaching 49 in. 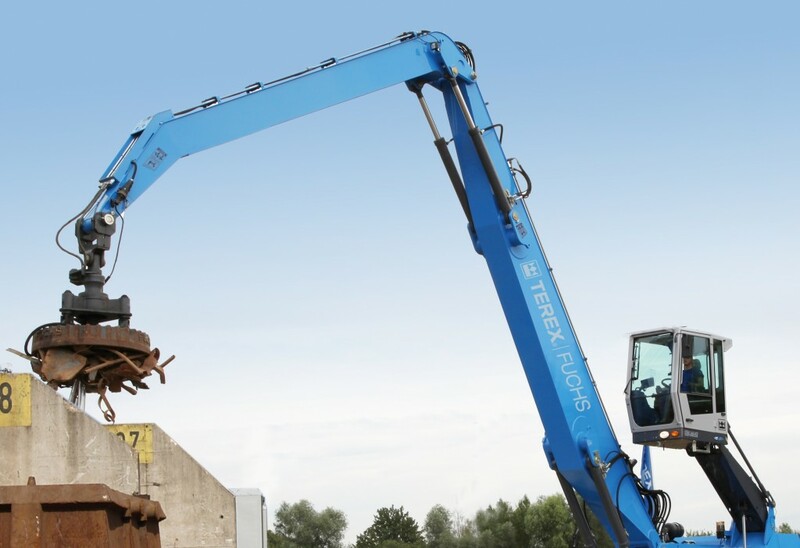 Offering a sturdy design, Terex Fuchs lift hooks deliver high lifting capacities ranging from 10 to 20 t, especially useful in heavy-duty rehandling applications. A full range of lift hooks are available to meet virtually any material handling need. Hook designs are available in standard or quick-change suspensions with either rigid or rotating designs. Terex Fuchs lift hooks along with the cactus grabs and magnets are available for any model of Terex Fuchs material handler. The full Terex Fuchs product range includes stationary, electric powered, rubber tired and track models. 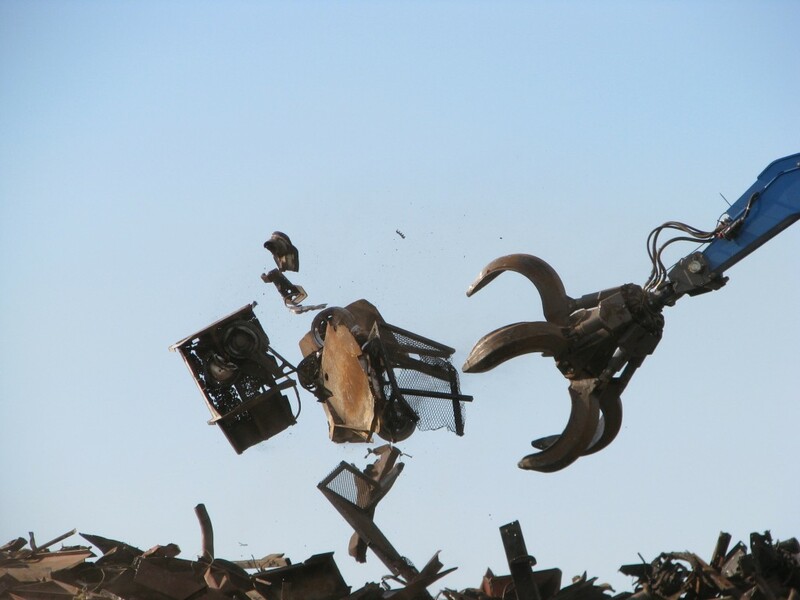 These purpose-built machines excel in demanding scrap, recycling, demolition and port applications. They offer work radii ranging from 26.9 to 72 ft and an elevated cab design to boost material handling efficiency. More information can be found at www.terex.com. Published on February 5, 2012 in Daily Dirt and Equipment & Products. Closed Tags: Cat, Caterpillar, construction, construction industry, contractors, Demolition, equipment, material handler, scrap, scrap handler. Caterpillar recently executed an alliance agreement with Exodus Machines Incorporated for the design and supply of material handlers to be sold and supported exclusively by Cat® dealers. These Exodus machines will be available immediately in North America and will complement Caterpillar’s current line of wheel and track material handlers greater than 27.5 tons (25 metric tons). These products will initially continue to carry the Exodus brand name but will transition to the Cat brand in 2013. The alliance agreement follows Caterpillar’s recent formation of a new strategic business unit, the Caterpillar Industrial & Waste Group, which has global responsibility for serving customers in these markets. The new group is part of the Diversified Products Division, led by Bill Springer, vice president of Caterpillar. Exodus Machines, based in Superior, Wis., was incorporated only three years ago and is now known for its innovative designs. Each of the company’s material handlers features an industry exclusive cab that lowers to the ground for easy ingress and egress and maintenance access. The wheel machines also feature independent planetary wheel drive for true all-wheel-drive. In support of the alliance agreement, Caterpillar acquired a minority equity interest in a new entity, Exodus Machines, LLC, formed by Exodus. In addition, Exodus plans to expand manufacturing in the Superior area and is working to secure working capital and capital funding, developing plant layouts, assessing building sites and estimating needs for new employees. The initial product offering consists of two machines that are designed to do one thing well – move material. Exodus engineers along with its suppliers, have created a mechanical orchestra of sorts where all the components and systems work together to enhance the capabilities of the others. Being purpose built is the only way this can be done to the fullest extent. Another interesting feature is its regenerative hydraulic system that makes use of gravity and energy to give the hydraulic system its power while saving on operating costs through low fuel consumption. Other notable features include: IQAN machine monitoring and controls; Exodus software engineers write the machine’s programs in house which means they can customize operating parameters, controls and machine functions to meet specific needs of a particular job or application. The Material handlers ride on 59″ wheels have 4 independent planetary drives with true all-wheel-drive; high clearance undercarriage with completely protected components; extensive auto-lube system; proprietary hydraulic controllers with Bosch Rexroth pumps; large comfortable cab with AC and tinted glass. Exodus is American made with American parts.